Can you imagine how it feels not knowing whether you or your family will be able to stay with you after 2019? Under what conditions? The anguish and despair that many families face are putting an unwarranted strain on them driving wedges between them and their communities. How can you create a future for your children if you don’t know what the future holds, will your family be torn apart? Will your children be forced to live in a country they don’t know, away from their friends and social connections? In June 2016, after the Brexit referendum result, the3million was founded by a group of dedicated EU citizens living in the UK. A dream for every EU citizen in the UK of maintaining their rights was formed. Since then we have been working tirelessly, researching, campaigning and creating awareness for the plight of EU citizens living in the UK. Over the last year, we have built a real momentum over citizens' rights and together with British in Europe, we have become the voice and the face of citizens in the Brexit negotiations. We have developed an incredible capacity to build policy proposals, legal responses and media releases, all of which is done by our team of volunteers. The campaign has also taken us to Westminster and Brussels on almost a weekly basis for the last 2 years, which would not have been possible without the donations of citizens like you who believe the3million and British in Europe are making a difference in the Brexit negotiations. In the coming months, we’ll still continue with our lobbying activities to ensure that EU citizen’s rights are protected in the UK, but we’ll also be providing community outreach and advice. We represent three million EU citizens here who are being used as bargaining chips in the Brexit negotiations. We represent their friends, families and co-workers who are affected by the Brexit process. 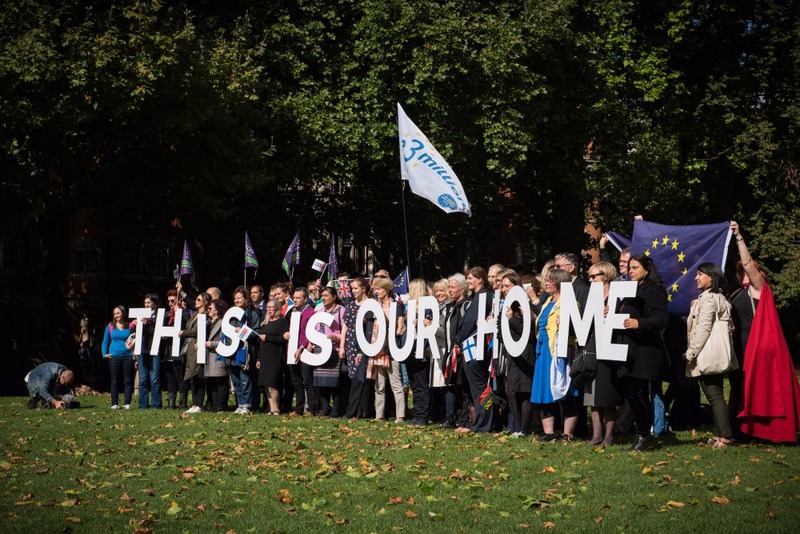 We are asking you to donate as much as you can to take the3million to the next chapter and help cement our future so we can fight for the rights of all EU citizens in the UK and help us to support local communities. Our next step is to establish the charity and become a force of change. We need £100,000 to help establish the3million, set-up the charity, office, media campaigns, research, outreach, promotion and advertising. This will also allow up to employ two amazing campaigners for a few days a week to focus on our goals and promote the message of the3million. In addition, this will support the dedicated team of volunteers who work tirelessly behind the scenes to make this dream a reality. Please donate what you can and encourage your friends and family to donate for a better and brighter future. Please give today so the UK will still be their home in 2019, and we can create a stronger society through unity. Since July 2016, we have been running the main advocacy campaign to make the case for EU citizens to retain the same rights after Brexit, under the protection of the Withdrawal Agreement. The campaign is supported by an active media relations function. We are building a support network for EU citizens through outreach services, so everyone has access to the most accurate and up to date information, either online, on social media, through their employer, their trade union or their community leaders. I want to thank you for your support through your donation to the3million. Yesterday's U-turn by Theresa May to scrap the settled status application fee was your victory. The overwhelming feeling is that it's a welcome decision, but it doesn't change that we should not be asked to apply for the status and rights we already have, and we now need clarity on whether the unrealistic deadline for applications will also be scrapped. While we at the3million feel proud we were named by the Prime Minister in her speech in Parliament in relations to her U-turn, the truth it would not have happened without you. 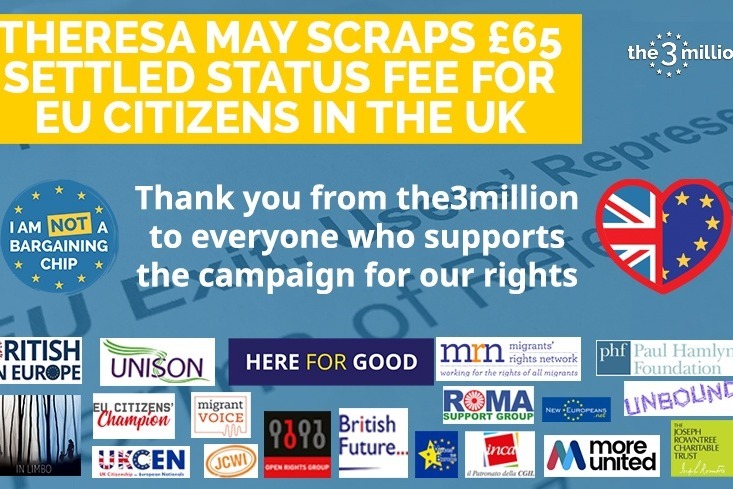 if you can afford it, please consider become a regular paying supporter of the3million ( https://www.the3million.org.uk/join-us) or make a one-off donation of the £65 you won't need to spend on your application on this page, so we can continue our essential work for all EU citizens in the UK in 2019 and beyond. Today, the3million and the Open Rights Group gave notice to the Government, in regards to the Data Protection Bill (see our official statement below), which is the first step of a legal action. This is important and goes beyond the fight for the rights of EU citizens as the exemption would impact all third country nationals in the UK in regards to accessing their personal data held by the Home Office. While the campaign intensifies, I am asking you to donate to the3million whatever you can afford, so that our team of full time volunteers can be supported to continue this crucial work. We will soon open the3million to members and we look forward to welcoming you in the organisation. "Today, the3million and the Open Rights Group sent a formal letter to Amber Rudd to give notice that we will take legal action against the British Government if the immigration exemption to the data protection bill is enacted. The UK's proposed secrecy in respect of 'immigration flows' is very concerning for EU citizens. It is diametrically opposed to the need for transparency and openness, and contrary to the terms of the European safeguards in the General Data Protection Regulation (GDPR) that will take effect in May. While the government has stated that their new system for registering the over 3 million EU citizens living in the UK will be 'simple, transparent and streamlined', they are seeking to stop these citizens from accessing data held on them. How can EU citizens, as well as all other foreign nationals living in the UK, rest assured their rights will be upheld when the government's words have not matched their actions? Yesterday was another day in our shared struggle shoulder to shoulder with the British citizens in Europe. 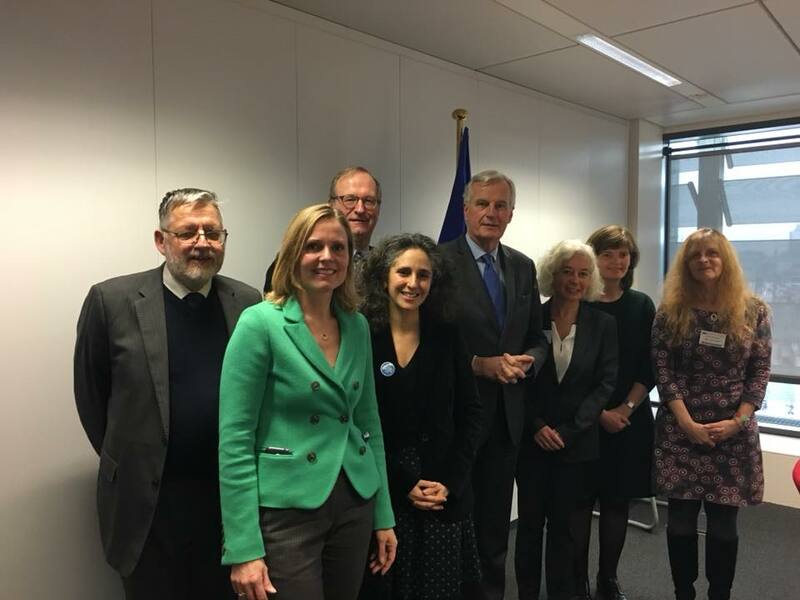 We were delighted to meet Michel Barnier. He listened attentively and responsively to all we had to say. That’s far more than David Davis has ever done given he’s not me with us yet (neither the3million nor the British in Europe). Barnier agrees with us that more needs to be done before a satisfactory agreement on citizens’ rights and the next couple of weeks will be crucial. 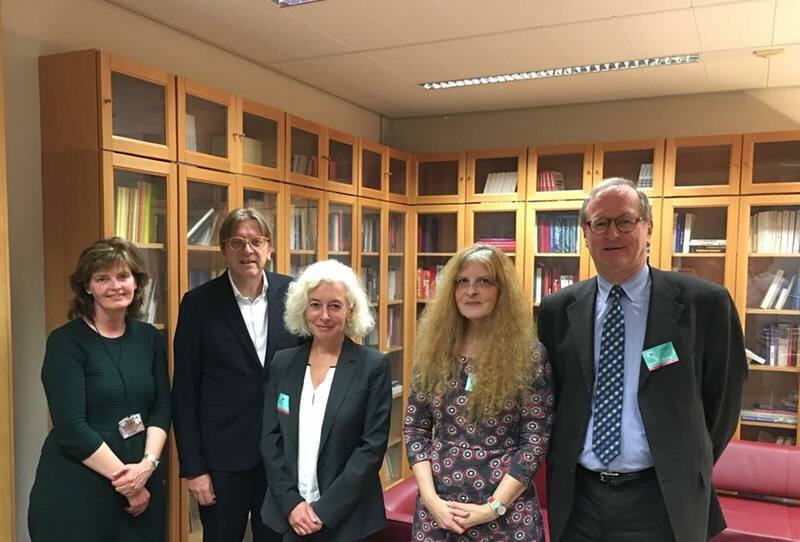 We also had a meeting with Guy Verhofstadt who reiterated his support to us, and then Anne-Laure Donskoy and Fiona Godfrey presented our shared concerns to the European Parliament’s Constitutional Affairs Committee. So, all in all we had a good day. We must keep the pressure up so that citizens’ rights will not be overshadowed by money issues and by the Northern Irish conundrum. 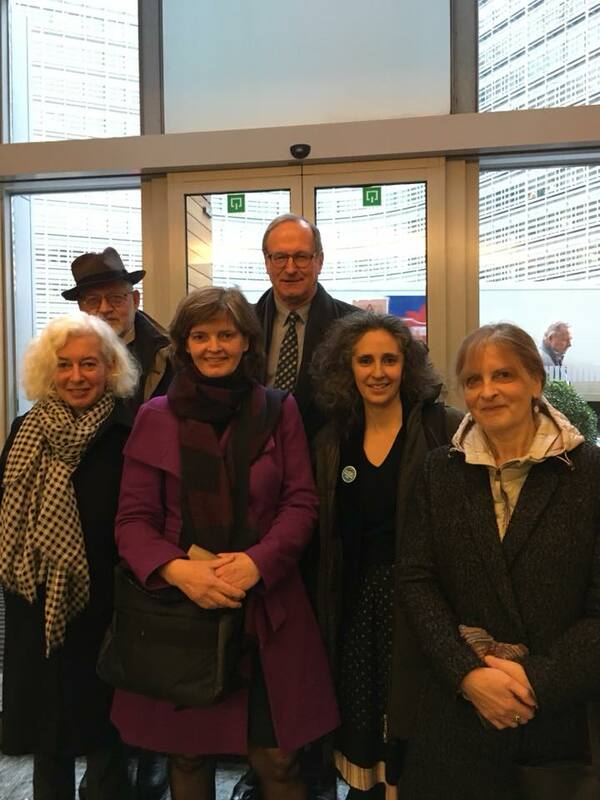 If you can, please continue to donate to our fundraiser, so we can carry on and send teams of volunteers to Brussels and Westminster and give a voice to citizens in the Brexit negotiations. We recently increased the target to £78,000 to align it with our actual costs. We will issue an update in December regarding the future of the3million and our application to become a charity. Of course, you will have the opportunity to become a member from the start. Firstly, let me thank you for your financial support. Without you, the campaign could not exist so please continue to donate as every penny counts for the safe future of 3 million EU citizens in the UK. The last 15 months have been a difficult time for many EU citizens in the UK and Brits in Europe but I hope the3million, alongside its partner British in Europe, is offering a glimmer of hope. From the beginning, we opted to constructively influence decision makers in London and Brussels and as a result, we have built a rather incredible advocacy capacity for a citizens' group run by volunteers. This in turn has given the3million a trusted stakeholder status with the British Government and the institution of the European Union, which is unique and unparalleled. There is little doubt that citizens' rights would not have been the top priority of the negotiations without our campaign and it’s telling that Theresa May claims it’s also her top priority (according to the letter she sent to all of us yesterday) when trying to appease EU negotiators. Likewise, the EU would not have had the kind of insight which informs their decisions on the negotiations if the3million didn't exist and it is very likely that citizens’ rights would have been botched, with terrible consequences for EU citizens in the UK and Brits in Europe. You have contributed to the success of the3million, and below is more information on spending and future plans so you know how your money is spent and what funding is required in the coming month. So far, all the donations have been used to organise events such as the mass lobby and the rally in Trafalgar Square, cover travel expenses to go to London and Brussels, build an effective network of volunteers and run systems such as the website, the newsletter or collaborative tools. Without your donations, there would be no campaign. For your information, I have assigned Ilse Mogensen* to scope out our funding requirements and fund-raising options as we are incorporating and looking at developing a charity model to sustain the current level of activities to be ready for January 2018. When we are ready, we will give you the opportunity to actually become a member of the3million. We expect this to be in January 2018. Thank you again for funding the3million and being the enabler of this necessary campaign. Many UK citizens were not allowed to vote in the Brexit referendum which will result in removal of their rights as citizens of, and residents in, the EU. "UK citizens resident overseas will also be eligible to vote, provided they have been registered to vote at a UK address in the last 15 years." https://www.gov.uk/government/topical-events/eu-referendum/about#who-can-vote-in-the-referendum By corollary, many British passport holding UK citizens (myself included) who have resided in the EU for more than 15 years were not eligible to vote in the referendum. I tried to register but was not allowed under the 15 year rule. EU/UK citizens who have been disenfranchised in this way by their own government have been contributing to the economy and culture of their European countries of residence and to the EU for 15 years or more, by working, paying taxes, buying homes and contributing to national, European and local communities and culture. EU resident UK citizens who were eligible to vote are also about to be stripped of their rights as citizens of Europe. I implore the EU to acknowledge and support the contribution of UK citizens to the European project by offering full EU citizenship and rights to UK citizens residing in the EU. An reciproal arrangements for EU citizens resident in the UK. Good luck with the campaign, @the3million! Thank you for this and I will make a donation soon after posting this comment just to say that along the 3 millions EU citizens in the UK, there are several thousands non-EEA family members who should enjoy the same rights which are already denied as non-EEA family members or EU citizens can't, for instance, use the online application form for PR along other unjustified restrictions. Dear Nicolas, I am very glad that The3Millon has been such a successful organisation , and I'm impressed by what you are achieving right now - taking the government to court ! That is impressive and ... they deserve to lose! I am curious about 3M's position on your voting rights. If EU national had had the vote, the Leavers would not have won, we know that. But all it takes is to demand that any future referendum be held on the residential /local authority census, which includes EU nationals. Even if it is opposed, it would cause a fuss and the issue with creep up the political agenda. On the other hand, you may think it isn't worth it, or would cause too much negative publicity. But it is legal and a vote in referenda is left up to the government of the country. Why shouldn't long term residents have a vote? Parliament might just vote for the local authority census to be used. I welcome your thoughts on this. I have had excellent support in enabling my husband to get Settled Status. Thanks.